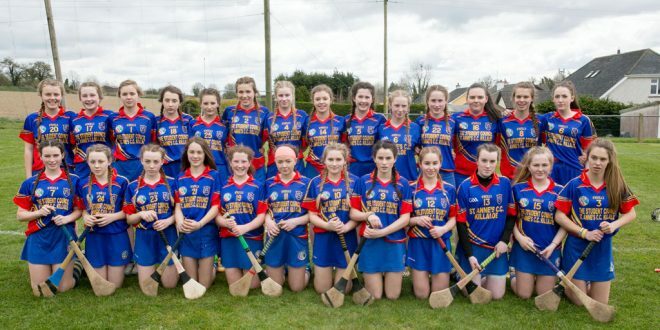 St Anne's Community College Killaloe camogie team. Photograph by Arthur Ellis. Bonfires are blazing in Killaloe this Friday evening after the local secondary school, St Anne’s captured their first All-Ireland camogie title. 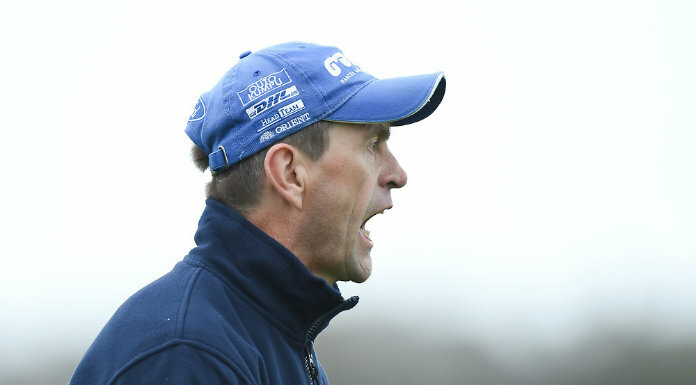 A merited win over Peresentation De La Salle from Bagnalstown in Carlow has earned the Killaloe side the All-Ireland junior D colleges title. 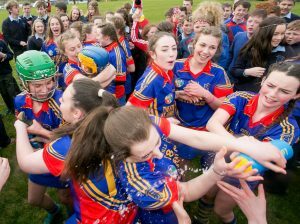 St Anne’s Community College Killaloe celebrate victory over Preentation De La Salle (Bagenalstown) at The Ragg. Photograph by Arthur Ellis. A tally of 3-3 from full forward Maeve Óg O’Leary earned her the player of the game award at the end of a contest n which they led from the outset. Playing with the aid if the breeze in the first half, they took the lead through team captain Aoife Power in the third minute and went on to be 1-6 to 0-2 in front at half time, O’Leary’s opening goal coming in the thirteenth minute. The player of the game struck for her second goal in the opening minute of the second half and this score really rocked their opponents and she had her third goal nine minutes into this half putting her side thirteen points clear and leaving the Leinster champions with a mountain to climb. To their credit, Bagnalstown never gave up but they just could not break down a strong an excellent St.Anne’s defence in which full back Susan Daly excelled. St Anne’s Community College Killaloe captain Aoife Power celebrates victory with her teammates at The Ragg . Photograph by Arthur Ellis. 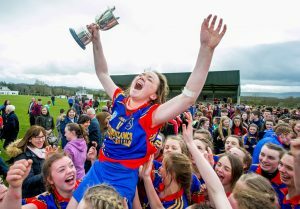 In injury time Jennifer Daly replaced the injured Aoife Power and she capped a historic day for the South East Clare school when she scored their fourth goal. Others to impress for the winners included Moya Marsh-McMahon, Lynda Daly and Anna Lee Marsh.